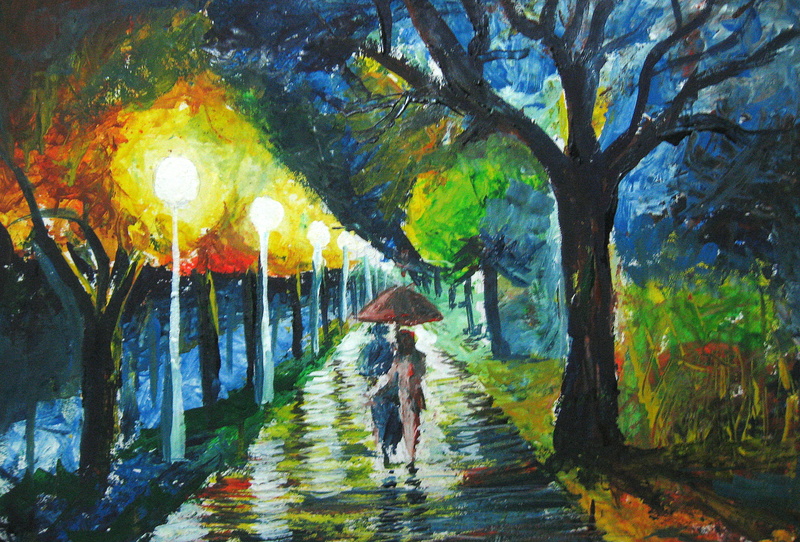 Recently I was checking out few paintings on deviantart.com. I found an artist Leonid Afremov. I liked his style. He uses oil paints and a palette knife. I decided to improvise and use what I can afford. So I bought a set of poster colors instead of oils. I used a plastic knife like the one used for cutting cakes instead of palatte knife. I was unhappy with ‘Bril’ poster color. It was a bit too watery and was not solid enough to stick to paper and give great texture that I was expecting. I bought Bril, hoping quality would be good.After all most of us in southern India have been using Bril inks from our school days. I still use it for my fountain pen. This entry was posted on February 3, 2012 at 1:10 am	and is filed under art. You can follow any responses to this entry through the RSS 2.0 feed. You can leave a response, or trackback from your own site. Nice painting! Improvisations are part of artists life! Good work – keep it up! Thank You Vamsi garu.Meeku na painting nachindi ani chaala santhoshistunanu. BTW – the above comment was a novice’s comment though! I am not an artist …..